I have completed FIVE sets for the Mitten Tree Project. The picture on the right shows a complete set. I purchased the hat and gloves so all I had to do was crochet the scarf. I used a simple single crochet rib stitch (only crocheting on the front loop) and added the fringe. I have 11 or 12 sets of hat/ gloves to work with. I need to count the number of orange gloves I have. I decided since we live in 'hunting' country, I'm going to get safety orange hats to match those gloves. The color will be a slight variation but the safety orange hats are required when hunting and many kids do youth hunt in the fall. I still need to print the bag tags for these and find a 'holding' bag. I'd like to find a red collapseable laundry basket. I stamp the front of the tag with a snowman and 'Warm Winter Wishes' then 1 hat/ 1 scarf/ 1 pair of gloves is printed on the back. I'll finish the 3 remaining black sets then move on to a new color. WOYWW #243 - I have a desk! We have a blast on WOYWW. Don’t have a clue as to what I’m talking about? Stop in at Julia Dunnit’s blog for all the DETAILS. In a nutshell, this gives us an open invitation every Wednesday to showcase what we’re working on and to peek in on work spaces all over the world. We would love to have you join us! Relatively clean. I at least have space to work but I'm not doing any creating while I work through Tiffany Spaulding's Get Organized Challenge. A couple of things to point out... The stack of paper to the left is all 'stamp off' paper. A small portion of what I have. I just can not throw anything into the landfill (or the shredder for the garden) until I've used it as many times as possible. Sad, isn't it. The manilla envelopes to the back right are those Teapot Tuesday cards I made the first week of the year. The square ones with the dog in the wheel barrow? They are square and they have bumpies so I put them in padded envies. The postal service wants over $6 a piece to mail them to Canada. So I need to rethink that card and save these for someone in the US. Finally, the sectioned box in front with the markers. Those are those mysterious markers that arrived in my mail last fall. (I finally figured out where they came from- thanks Brandy!) Because they need to be stored horizontal they can not stay in that box so I'm still working on an 'upcycle' item solution. However, I did get an idea from Heidi Bound at Gotham City Stampers about putting all of her Project Life items in one of these. I'm going to Dollar General tomorrow to pick up the long one - or maybe a second one of these as I like the sectioned sizes. I wasn't sure I was a Project Life kind of scrapbooker but have since determined they would be perfect albums for my granddaughters now living so far away. Oh, and the pink hippo stuck in there will be a pattern for a TPT card I needed last week. I really need a hippo stamp or image but I can make this work. So what's on YOUR work station this week? Until this back issues settles down and I've completed the Get Organized Challenge, I will not be showcasing any of the Teapot Tuesday cards. I am keeping track of them and plan to still make the cards but this will take a few weeks yet. So hang around. I pinched a nerve in my back a week ago and although the 'pain' is gone, the muscles are still sore and enjoying heating pad time - a lot. :-) Of course, this is slowing my progress on the Get Organized Challenge. Thankfully Week 1 was all about Defining our Benefits of an organized space, making our themes list and gathering everything to be sorted in one location. Thanks to everyone who stopped in and viewed my slideshow. Showing off my room in it's present condition was scary but a necessity to showing how far I will have traveled on this 8-week journey. Maybe tomorrow my desk won't look so scary for WOYWW. I hope you'll come back to see. Today marks the final day to do the assignment for Week 1 of the Get Organized Challenge with Tiffany Spaulding over at TheScrapRack. Although Tiffany sells The Scrap Rack, she doesn't say you HAVE to use her product. She is all about EDUCATION. She truly wants everyone to be organized and ENJOY their CREATIVE JOURNEY. I am DOING the assignments. I am DOING the steps to finally put my studio back to the way things were before I began sharing the space with my daughter when she moved back home with my first grandchild. Something about 'sharing' that space kind of sucked the creative energy right out of the space. I'm looking forward to putting things back to rights and doing a thorough sage cleansing to restore balance and positive energy again. So with these pictures out for all the world to see, let's move on to Week 2. We're going to be talking PAPER. Thankfully, mine is pretty much where it goes. There will be some minor changes at the end of the course when I add my very own SCRAP RACK! Until I have a place to actually work on Mixed Media, my Monday posts will be about the organization I've been trying to put into place. I've gotten a jump on one of Tiffany's categories. Not because I'm an over-achiever (though I've been accused of such nonsense LOL) but because I HAD to get this put away so I could move forward with the rest of the room. Over the course of the last year I would find ribbon I just had to have (come on, you do the same thing). But instead of taking time to put the new pretties away, I'd leave them stacked or bagged up in the studio. I decided as part of the clean up/ reorganization they were all getting put on the cardboard bobbins. The seasonal themes will go in their own containers. I'll file the Neutrals within their spot in the drawer. The third one of these drawers is a hodge podge of various fibers/ ribbons that did not fall into a specific color AND the wide wire-edged Christmas ribbon. I'm going to move the Christmas ribbon over to whatever container I can find large enough to store all of the bobbins in one spot, Clear out the rest of the drawer then put all of my lace trims on bobbin cards. Right now they are more a tangled mess in a plastic shoe box. Not pretty. There is a gal in CO who wants to put all of her ribbon BACK on spools so they are off to her tomorrow. I have space! Not much and I'm not planning on playing before the weekend. My main goal is to get the studio back in working order. As you'll see from the previous post, I did get my ink tray finished. YAY! But the space where the ink tray is now is where I use to keep my marker/ pencils/ etc. So now I have to figure out the best place to relocate those. The package of Letter stickers are from a project I made for work. I keep me from playing favorites as to which music artists I feature on my music blog every week, I created a deck of 26 alphabet cards. Each week I draw 5 letters then use random.org to select 5 names from a long list of artists under each letter to feature on The Party List. Otherwise I'd be going back to my favorites all the time and missing out on showcasing some really great talent in Texas. The rest is all bits and pieces I'll either be finding a place for or pitching. I've done a lot of pitching the past couple of weeks. If you follow my LINK to Julia's blog you'll see a long list of other blogs you can visit. PSST... Click the bottom left corner of the Kizoa screen and you'll see a Play arrow that activates the music to go with the slide ;-) Afterwards, click the pause button if you don't want to hear the loop play again while you read the 'how to'. After weeks of attempting to get this thing put together, I finally got the Ink Tray finished. My Goal was to have all of my current ink spots w/ their duaber, the ink refills and a mister bottle within reach. Before whenever I wanted a color, I needed to pull out the little sterilite container with that color family. While the sterilite's worked, kept everything in place and technically, took up less space, I wanted to see all of my colors. Also, in the sterilite, the water color crayon tin is under the spots box and there was no place to store the mister bottle. I want to make a glimmer mist for each color. So whatever color I'm working in, I have all the tools I need in one spot. I started by laying a sheet of paper out on the top of my ikea paper cabinet and sketching out the design, incorporating the size needed for the spots, the refill bottles and the mister bottle. 1) I recommend a box cutter as opposed to an Xacto blade. The Xacto has a tendency to flex, altering the dimensions - speaking from experience here. 2) Use a hot temp glue gun with multi-temp or hot-temp glue sticks. KEEP YOUR FINGERS AWAY FROM THE GLUE... or you may find yourself minus finger prints should the cops ever need them for some reason. After everything was glued into place, I drenched 3/4 of a yard of good quality quilting fabric in a 2-1 homemade modge podge and draped it over the entire frame. Because of some of the inconsistencies I spoke of earlier, I had to really work the fabric into contact in some places. You will want to do this on a large flat surface covered with something like a cheap plastic table cloth or a large trash bag. This will keep your fabric from sticking to the table and easy removal after everything has dried. I did mine in the center of the dining room table and turned on the ceiling fan. Mine dried solid in about 8 hours but I left it over night. The other useful tip about covering the whole thing is then the fabric in the openings was nice and crisp, making it easier to cut those pieces away with the exacto knife. I wanted the top to offer a pop of color... not just the white on white. To attach the bottom into place, I flipped the frame over and ran a bead of Aleene's Tacky along every piece of the ribbing then pressed the base into place. With the tray still upside down, I put the folding table on top (still collapsed) and left it sit over night. this provided a consistent weight over the entire tray and left it undisturbed for the glue to really take hold. The tray not only houses the inks but I built in a slot in the back to hold the watercolor crayon box, too. And while this didn't turn out 'fancy' pretty, it is going to serve the purpose. Next task... finish the SU embellishment storage boxes. This week we do something a little different - we are showering not one recipient but two with love and support. Elke and Kendra are best friends. They work together, take their dogs to the park together and even sneak out for Pepsi and salted chips together. When Elke was diagnosed with breast cancer, Kendra was right there, lifting her up. After Elke's surgery, Kendra found a lump of her own. So this week we honor both of these strong women with anything pink, dogs, friends and bosom buddies. I had one plan in mind. You know the 2 pieces of the heart... one says best and the other friends. Well, while searching through my stamps for a heart to use, I came across this cute little puppy in a wheel barrow and had to use him. Who knows.. I might RAK these girls later when I can play more. I want to get involved in challenges again this year so I've started by returning to my old StampToSpend group on SCS. Ina's first challenge of the year was to reach back in our stash and use paper from 'way back when'. I found this 8.5x11 sheet in the file box. The paper is from 1996 - Hot off the Press - Muted Roses. I'm nearly finished with the ink storage thingy and that's what I was going to show you today. But am going to have to wait until next Monday. I should finish all the trimming up this afternoon and will schedule the post. So here's your chance to get your name in the hopper for some great embellies and papers to work with. Doesn't this collection look YUMMY! I'm glad she picks randomly because that means I have a shot at this awesome vintage collection of goodies. So skip on over to Cuddlebug Cuties and register! I will have a couple of cards tomorrow for TeaPot Tuesday. We have a double whammy of Bossom Buddies needing a 'lift'. My studio is a disaster. There's just no way around it, literally, though I have been making progress the last three days. Remember four months ago when I began the reorganization project? Well, most everything got pulled out and the sorting process begun when we had the flea infestation. I had a few in the office but nothing like we had upstairs. My office became a black hole while we focused on the extermination and the bedroom remodel. Now I have this mess waiting for me and I'm going to tackle it. I had planned to run a 6-week Organizations class here in The Studio. But the awesome Tiffany Spaulding from ScrapRack is offering her class beginning January 21st. I've taken her class before but never really FOCUSED on the assignments. I also didn't have the G4 internet last time. Things are in better alignment to take something away from her class this time around. Let's take Tiffany's class together! Just go HERE to sign up. The class is FREE. 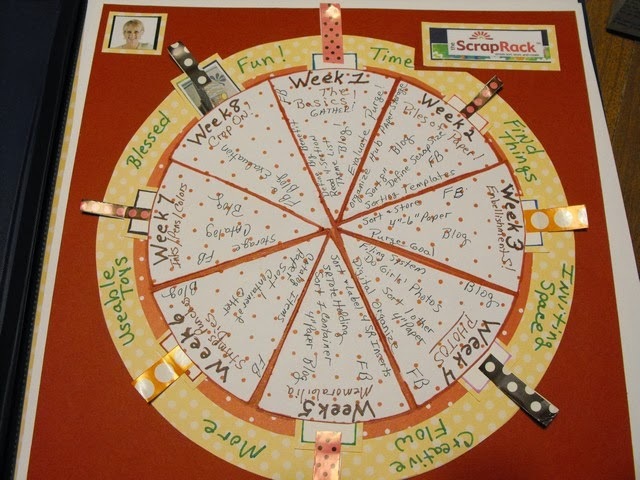 Each week you have an interactive webinar focusing on an area of your crafting area as well as an assignment based on that week's topic. And best of all, even though Tiffany owns ScrapRack, she isn't pushing her product. She is sharing with you options for storage and organization - and not all of the items are ScrapRack. I've known Tiffany on-line for several years. I use to belong to her yahoo group and still follow her blog on occasion. She's even helped me with a freelance assignment when I needed some info. She's a neat gal with a passion for organizing and creativity. So my plan is... let's take her class. The day after the class airs I'll post what I took from the class and how I'll incorporate my studio into the assignment. I will encourage you to share your perspective and progress as well. Let's turn this class into an AWESOME discussion and get our studios in shape for a Creative 2014! Sound off if you're joining us!